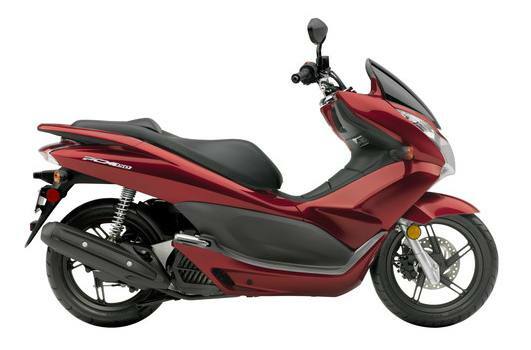 Think of the new Honda PCX150 as the do-everything scooter. It offers the fuel economy of the most frugal scooters out there, but it’s big enough and powerful enough to carry a passenger and ride on the highway. Storage? Check. Automatic transmission? Check. Easy to park? Do you even have to ask? A blast to ride? Double check on that one. The new PCX150 has it all, and it’s the perfect choice if you’re looking to replace that second car with something a whole lot smarter for these times when every dollar counts. Power to the People: With its new, bigger 153cc liquid-cooled four-stroke engine, the PCX150 is powerful enough to ride on the highway and carry you and a passenger, all while getting up to 102 MPG. More Than Meets the Eye: The PCX is all about taking care of its rider. Exhibit A: the large seat and floorboards. You get room to move around and your passenger gets plenty of room too. The full-length floorboards and step-through design also makes getting on and off a whole lot easier. Space Explorer: A full 25 liters of underseat storage is safe, secure, and convenient. Use it wisely—to store a helmet, your groceries, office materials and more. Electric Start: There’s nothing wrong with retro, but when you’re riding every day you need a scooter that offers you all the modern conveniences and features that the PCX150 does. Its advanced technology and design not only make the PCX150 practical, they make it more fun to ride. Rider Comfort: That long, plush seat does more than just look comfortable, it's probably nicer than that sofa in your living room. An improved seat cushion this year makes it even better, while the stepped passenger section gives your copilot a better view. Underseat Storage: Flip that seat open and you have 25 liters of storage, enough for a full-face helmet and groceries for Thanksgiving dinner. The main compartment locks for security, and is weather-resistant too. There's even a second compartment in the dash for your mobile phone, wallet or MP3 player. PGM Fuel-Injected Engine: With plenty of power to carry you and a passenger too, the PCX150 features liquid cooling and Programmed Fuel Injection (PGM-FI) for great performance in all traffic conditions. 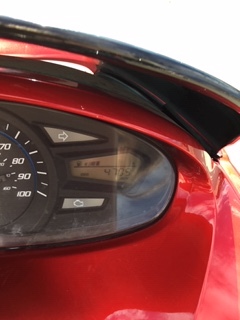 Plus the PCX150 offers some impressive fuel economy too—up to 110 miles per gallon! V-Matic Transmission: With the Honda V-Matic automatic transmission, riding couldn't be easier. Just start the engine, twist the gas, and go. The V-Matic means no shifting, ever – so you concentrate on the road ahead and simply enjoy the ride! The V-matic is a continuously variable design, so you'll never feel it lurch from one gear to another. Smooth. Easy To Park: The PCX150 gives you the choice of both a sidestand and a centerstand. That makes it easy to park for a fast dash into a store (the sidestand) or when you need to park it upright in a tight space (the centerstand). With a lot of other scooters, you only get one or the other.